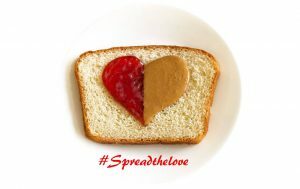 February is the Month of Love and on February 10th, we spent the morning spreading LOVE at our #Spreadthelove PB&J Event! Our amazing and committed volunteers made and distributed peanut butter and jelly sandwiches to local families in need. 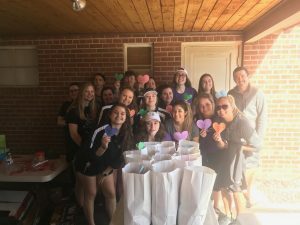 WARM THANKS TO…Grand Canyon University Women’s Hockey Team, Katherine and her boys, Kristina Charlton and Grace, Joe, Donovan Strickland and Bonnie Stallings! Sixty-five grape and strawberry peanut butter and jelly sandwiches were made for the Weekend Lunch Program for kids in need in the Scottsdale Unified School District, Ingleside, Tevan and Arcadia areas. The bags were filled full with applesauce, peanut butter crackers, granola bars and lots of Valentine treats. Feed Our Babies also helped 20 families with emergency food boxes. For more information or to RSVP for an upcoming #Spreadthelove Event, please email info@feedourbabiesusa.org. If you are unable to attend but would love to make a donation, visit our Donation page. 100% of your donation goes towards our programs. We hope to you see!